It is a little over two years ago. The band I play in, Sweetwood, was going through the final rehearsal before we would do our first ever gig, at The Jammer Festival in Zoeterwoude. In the cabin next to us another band was working hard, the music seeping through when we had small breaks inbetween songs. In the break we happened to meet four youngsters who were also rehearsing for their show at the festival. Their band was called Fort Da, a bit strange name for a band that played a set that was extremely eclectic. From early The Beatles pop, to Billy Joel MOR and Madness ska. It was as if Fort Da could not make a choice what it wanted to be, not in the least because it did not only surprise me, it also convinced totally in each genre. So why choose? Fort Da has become Sunday At Eight and at the cd presentation show of The Stream late August the band also played a show. The cd I am currently listening to is produced by Jan Stroomer of The Stream, so no coincidences there. Musically Sunday At Eight fits in well with The Stream, so no coincidences there either. 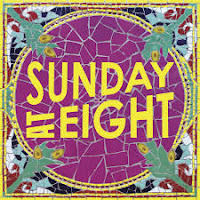 'Sunday At Eight' provides the listener with the right mix of what Sunday At Eight has to offer. All the sides of the band show on this mini album. The album opens with 'The Thrill', a song released as a single in 2017. 55 Years of pop music come by in 3 minutes and a little. The piano of singer Damiaan van Noort is central on the song. An organ in the background gives the song a warmer feel then when played live. Wouter Bontje's guitar solo is very George Harrison, warm and fitting. The intro of 'Rain' is very 60s. What happens is even older somehow. The vaudeville sort of music that inspired Paul McCartney or Ray Davies many times. The piano rolls in a very pleasant way. The tight rhythm section keeps the song very much together, allowing the piano and the vocals to take off in the right places. Somewhere on the Internet can be found that it is the record collection of fathers that inspires Sunday At Eight. There's simply no denying there. These four young men, bass and saxophone player Bas Janson and drummer Antonio Kamerling complete the band, love music from a time long before they were born. Listening to 'The Game' a lot of these influence come together. Jan Stroomer lends some musicians from his band on strings. The guitar solo brings the best of Kayak and Focus to mind. Some early Dutch prog has not gone by unnoticed. The ska side comes through also. Except for drummer Kamerling all the band members switch instruments to play this music that is carried by Janson's sax. He may not be the very best saxophone player, the mood of ska or better Two Tone, is captured with ease. Four songs into the album, I find that Van Noort's voice on record does not sound as good as it does live. It may be more, at least that's my impression, from his singing too self-consciously in the studio, something that may change with experience, than a real problem for the band. Time will tell. The changes in the arrangement of 'The Game' show how adapt Sunday At Eight at working on its songs. These variations really work well. 'Turn The Tide' has a fantastic intro, wide and sweeping. Again a totally different song from all the others. Here it's the guitar(s) that are dominant, changing the mood and the sound of the band. The whole of the song is not as good as the intro seemed to promise me yet this is a fine song, deserving to be heard by a larger audience. Again the band surprises with the direction the song takes as well. The mini album ends with a pastiche with a jazzy feel. Something 50s, something The Beatles, a little The Kinks. 'Sunday At Eight' is only six songs long, yet it seems to hold many more songs and in a way it does. As this is the band's first album, that is certainly excusable. Sunday At Eight shows the world what it is capable of. The album reminds me of the work of Jan Stroomer. The more he took Goethe's famous phrase to heart, the better his albums became. With "Sally" as greatest example to date. There is a lesson there for Sunday At Eight as well. In the here and now though I am listening to an eclectic first album showing exactly where Sunday At Eight is at: here and there at the same time and somewhere in the middle as well.